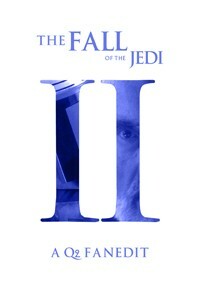 Continuing with the Fall of the Jedi trilogy, Episode 2 cuts poorly written dialog and bad acting while enhancing the romance we’re suppose to believe in between Anakin and Padme. Also gone are references to R2D2 and C-3PO and moments that broke continuity with the original trilogy. Additonal Note: Some early viewers have asked me why I didn’t remove Anakin’s surname from the second film. (He maintains “Skywalker” in the first film as well.) The concern is that by keeping it in the film the audience will know that Luke is related to Anakin in A New Hope. I never felt that this was a mystery, nor that keeping the audience in the dark about it was needed. My rationale for this is that in my cut of Episode 3 we know Anakin and Padme are pregnant. By the end of the film we know that child is actually twins, but it’s never revealed that one is a boy and one is a girl. Their names are never given either. 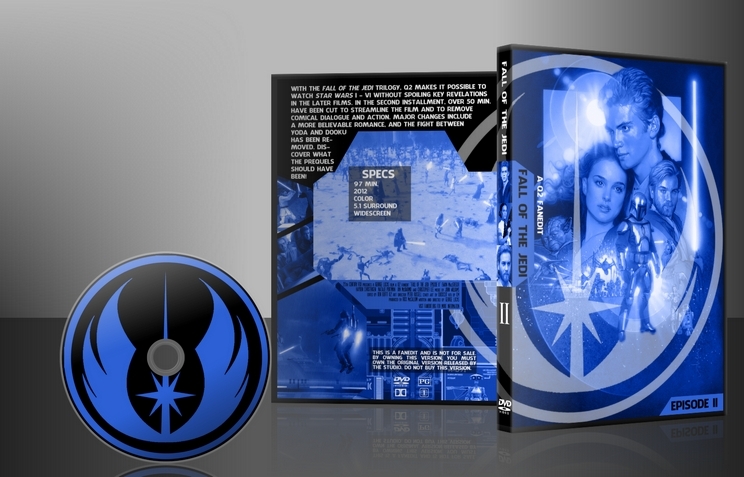 All we know at the end of the third film is that they need to be split up to be kept safe, and that Padme takes one while Obi-Wan the other. The idea, hopefully, is that most people will assume identical twins, not fraternal. This way the sibling mystery is preserved. Also, in my cut of Episode 3, the last time we see Anakin is when Obi-Wan walks away from him as he burns alive. We never hear the name “Vader” in my cut, nor do we see Anakin being built into how we see him in the OT. With these changes I feel I’ve maintained the mystery I wanted to preserve. Knowing Luke is the son of Anakin doesn’t hurt the flow in my opinion. Knowing that Anakin is Vader in the OT does, as does knowing Luke and Leia are siblings. Please remember my goal was to edit the PT in such a way that someone who has never seen any of the Star Wars films could watch them in order without having key moments in the OT spoiled by the PT. In this I feel I have succeeded. This list is in no way complete, but it should give you a good sense of changes. Easily my least favourite Star Wars flick and now I find it watchable. Q2 has done an excellent job here, the only issues I had with it were the story from the source material and there's only so much that could be changed! Still, If I can get through a sitting of AOTC then we've all achieved something! The main issues with Attack of the Clones to me was its bad dialogue and slowish tempo. CGI is quite a bit outdated as well. However I like the movie and prequals altogether. That being said Q2 has edited the movie into faster phase, made the dialogue and with it the relationship of Anakin and Padme more convincing and less cheesy. 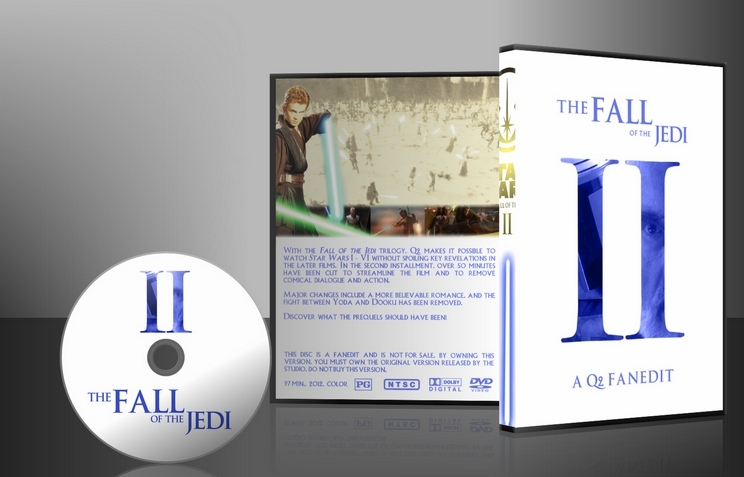 There were a few big scenes the faneditor cut like Obi Wan chasing Jango Fett and also Yoda VS Count Dooku battle. Now these are the biggest issues to me with this fanedit as I liked them both, even the lightsaber duel of Yoda VS Count Dooku. To compensate the loss Q2 has also cut a lot of bad scenes. Audio quality was great and video quality was quite good as well, although the image felt a bit too light(?) and mushy.. but only a bit. Compared to what? Well, for example to The Approaching Storm fanedit or original Blu-Ray. Video and audio editing were done very well technically. 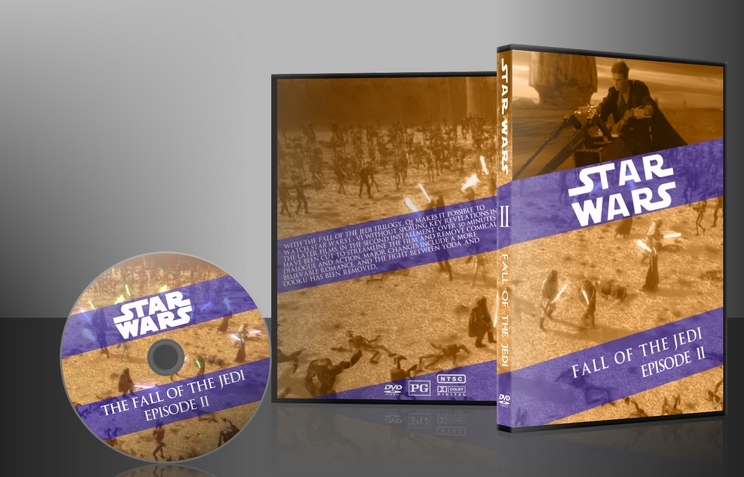 Overall this fanedit was pretty good, although not as good Q2's Phantom Menace fanedit in my opinion. It accomplished its original goal nicely. Just watched this fanedit, and again it blew my mind Like the one for Episode 1. All the goofy humor is gone, the videogame level (droid factory) is gone, and all of a sudden, the romance doesnt seem forced anymore. Not that we can really feel the love story, but we can actually believe it now. Like Fall of the Jedi I, this version builds upon a movie i can purely enjoy for shallow entertainment and makes a movie that i can enjoy at a level that recognizes it as a real Star Wars movie. Just like Episode 1, i dont see any technical flaws here. Quality is of the absolute highest standard, and at no point is there any sign that this version is "just" a fanedit. One minor continuity error is that Kenobi's ship is visibly damaged after the missing asteroid belt sequence. But i refuse to take a point off for this, since editing is still of the highest quality. There isn't much here to say that I didn't say in my review of Fall of the Jedi I. Everything I said there holds true for this movie as well. All the nonsense is gone and what we have now is a reasonably good film. Rated the narrative down just a bit, but that probably just because the theatrical version is even less salvageable than either I or III.